How would you implement a new accounting system? Implementing a major accounting system is big undertaking which needs a lot of planning. Get Buy In – its really important that the system gets the support of the Senior Management Team and that key staff are given the chance to put forward their ideas and are involved in the project. People are often resistant to change and getting them involved early will breakdown barriers to change. 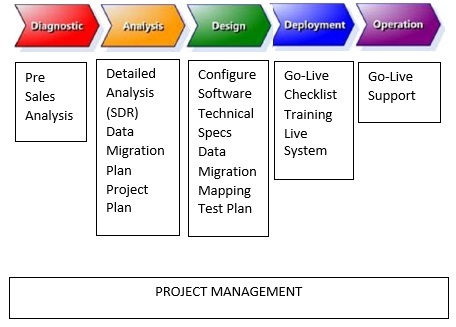 By using simple project management processes, tools and techniques you can achieve the best results. Head in the cloud …… feet very much on the ground! September 26, 2013 10:47 am / 1 Comment on Head in the cloud …… feet very much on the ground! I’m a director of a software development business which develops ‘cloud’ based applications. Of course, when we started in 2005, I was quite unaware of this, but then the marketing men seized on the ‘latest idea’, gave it a label so that they could sell it more easily, and hey-presto, ‘the cloud’ was born. So if we set aside all the marketing hype, what exactly is ‘cloud computing’? I’m not an ‘IT Professional’ so forgive me if I reduce this to more simplistic terms but actually it is quite straightforward, and in many ways something of a natural progression in a trend that has gained momentum over the last few decades. If I can go back further for a moment, I can recall managing the new IT department of a large manufacturing operation in the early 1980’s (the directors didn’t really know where it should sit within the organisation so they gave it to the accountant because it had something to do with ‘information’). In those days, data was input by cards or paper tape, and we had a department of ‘punch card operators’, and an air conditioned room in which sat a ‘mainframe computer’ which was the size of a small car, and had various attendant tape drives for storage of data and programmes. Users had a screen and keyboard and a wired connection to the mainframe to and from which they could send and retrieve data using application programmes which controlled how that data should be input and processed or presented when retrieved. All the processing was done by the mainframe as it was the only computer in this network of users and machines. The advantages were clear and immediate: instead of having to walk to the other end of the factory to speak with a colleague who kept a written record of the information we were looking for, a user could now sit at his or her desk and look at the data which that colleague had input only moments earlier. We then saw the explosion in availability of the personal computer (PC), cheaper and more flexible yes, but a backward step in productivity since written records were replaced by computerised records, but now held on desktop machines. And so we were back to walking the corridors to speak with a colleague who kept a computerised record of the information we were looking for, but this time carrying a floppy disk to write that information on rather than a pad and pencil. Hence the advent in networking these PCs to a central ‘file server’ which, as the name suggests, is designed to store our files. Again this enabled us to work more collaboratively and more productively, by working on the same files and data, and indeed more securely as protection and regular backups of centralised data is far easier to achieve than for a myriad different personal computers. The only real difference between this model and the early mainframes is that whereas the mainframe computer did all the work – stored the data, retrieved the data, ran the software applications, and so on – now the work was shared between the server which largely stored and retrieved data only, and the PCs which ran the applications to process that data, so overall processing speeds reduced dramatically whilst achieving a significant cost saving over a mainframe investment – a real ‘win-win’. The development of ‘data warehouses’ where the centralised data storage was taken away from ‘in-house’ networks, and to more secure remote locations with ‘thin client’ access to data and business applications, was essentially a return to the mainframe model, and with much more powerful modern servers, overall processing speeds reduced still further. However the real driver for this change was again an economic one – why spend money on lots of expensive PCs and a server, and all the attendant network paraphernalia and maintenance, when one very powerful central server could do it all, and all the users would need would be a screen, a keyboard, a mouse, and a telephone line (hence the thin client)! I would have to say that this latter development probably by-passed most small and medium sized enterprises (SMEs) and still remains the reserve of larger firms who can afford the fees charged by vendors of large ‘enterprise’ (organisation wide) applications. However, cloud computing is really little different to the thin client arrangement in that it enables access to data stored on a remote centralised server, and the applications to process that data. Our own cloud based applications store data on servers in the North of England, with backups in Docklands, and whilst most of the processing takes place on the server, some is done on the user’s PC, so that we can harness as much processing power as we need to ensure fast response times. 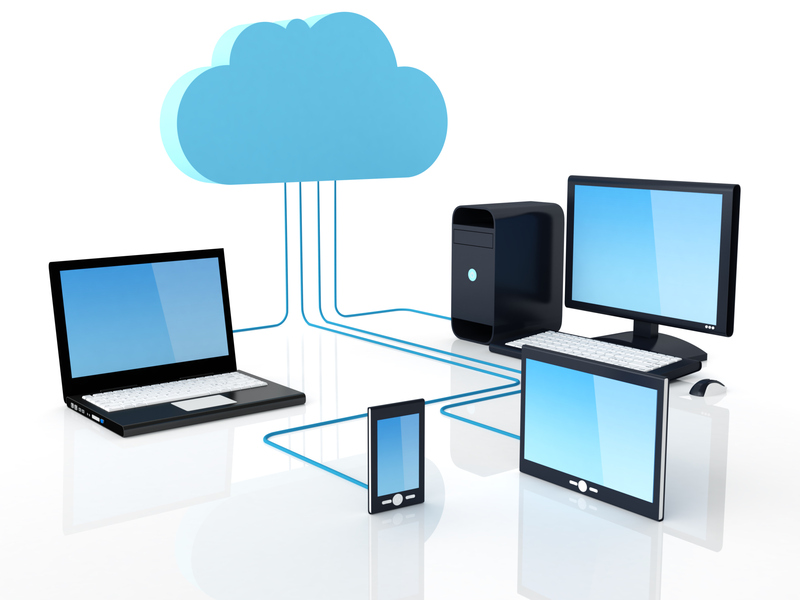 At its best, the cloud can provide access to software applications and services previously available only to larger enterprises, to smaller firms, and at a very economic cost, often on a ‘pay-as-you-go’ or rental basis instead of outright purchase – this is often termed ‘Software as a Service’ (SaaS). And so to the inevitable questions: is cloud computing safe, and is it reliable enough to use to run my business? Most small and medium sized enterprises do not have a dedicated IT team at their disposal, and as a result, backups may not be made reliably, firewalls and anti-virus software may not be the best (or as I have seen, not exist at all), and network access may require nothing more than a password written down on countless sticky notes attached to keyboards and monitors around the office. The level of security employed in a cloud environment is likely to be significantly higher on average then the security of a typical SME, but it really is for prospective users to verify this for themselves: where is the server physically? What do you know about the firm that runs and maintains the server? And is the application you plan to run secure? I would not claim that any application or network is one hundred percent secure (there have been too many high profile news stories to the contrary) but for example our accounting/ ERP application includes encryption between user and server so that even if the data transmission is intercepted by a hacker, they will have nothing more than a string of gobbledygook – a whole lot better than someone being able to hack into your in-house network and steal files, or even physically break into your office and steal a laptop with confidential data on it, or indeed losing your in-house data in a fire, all of which have happened to clients in the past. That said, there are draw-backs, and in particular, reliability: do you have a reliable connection to the Internet, and does the cloud service provider give any guarantee of service availability? I have sometimes advised prospective customers to look at ‘in-house’ software applications rather than our cloud based ERP application where they have poor or unreliable broadband, though this is becoming less of an issue as the infrastructure improves, indeed we even see our clients taking and processing customer orders directly into their system at trade shows using just a tablet computer. And our experience with the firm who warehouses our servers has been good to date in that in five years we, and therefore our clients, have experienced only twenty minutes loss of service on a Saturday just before Christmas 2010 due to an attack by hackers on one of the other servers located in the same facility (this was dealt with effectively by the server centre staff without any need for our becoming involved), and this compares favourably to all the hours work lost previously when our in-house network has failed because one-or-other component or machine had stopped working (often following a software ‘upgrade’). So is cloud computing for you? A first step might be offsite backup and storage of your valuable data either by way of a simple copy and paste routine using Dropbox or Google Drive, or one of many providers that enable you to schedule regular data backups without any intervention from the system user. You might also consider having your e-mail accounts hosted by an external provider, perhaps the same one that hosts your web site? And what about your accounts/ ERP, or other business critical applications? Ultimately only you can decide – for me, as an accountant, this is just a normal investment proposition – what are the pros and cons for my particular organisation and what are the relative costs? Having actioned all the above in our accounting practice several years ago we immediately saved c.£3.5k when it came to replace out onsite server, quite apart from time and money on maintenance, servicing, and updates. Will your experience be as good as ours to date? I really can’t say. All I would suggest is that you check out the supplier of cloud services in the same way as you would anyone that is offering you any other service: Who are they? Do they have a good reputation, have they been recommended? All I can hope is that this article has helped you to better understand what the cloud is about, and to therefore make a more informed decision. For anyone running a large networking or membership organisation coping with thousands of transactions of the same value is a challenge. In the case of 4Networking, Tuesday to Friday thousands of members are booking breakfasts online for £12 each (they all need a VAT receipt) [note in addition to breakfasts its £499 plus VAT to join and there is an annual membership fee after the first year], so what information do they analyse, well they need to know, which member or visitor, which group/venue, which area leader, for visitors they need to know the number of visits (so that they can charge when the maximum is reached), when membership renewals are due. Thats a lot of information and to run an efficient network you need to quickly see the results and take action if attendees drop. Discuss the requirements with the client and then document the project plan to deliver in the time-frame and budget. Understand which team members are accountable for what deliverables. Define the chart of accounts and tracking codes so that the right level of analysis can be obtained for tax, accounting and management control purposes. Ensure that the final trial balance from the legacy system is accurate and balances before you load into Xero. Get all the invoices that make up the accounts receivable and accounts payable balances and load them into Xero via invoice import. Get bank feeds working for all bank accounts – don’t import CSV file bank statements – this is where productivity is improved. Define your record keeping system – how do you find the payable invoice to match that in Xero – you can scan it and attach the image to the Xero transaction or keep a hardcopy or softcopy outside Xero. You want a system that is robust if it is inspected. Setup up your sales invoicing templates in word for invoices, statements and credit notes and upload into Xero. Use repeating invoices where possible to get the productivity. Set up inventory items for the things you sell and you can analyse volumes and margins by item for goods or services. Define when you will reconcile the bank statement – continuously, weekly etc. Setup bank rules to improve the speed and consistency of matching and coding. Understand the reconcile and cash coding screens. Understand how the reconciliation report works. Understand accounting transactions and how Xero presents a bank account. Decide if you need to use Accounts payable or can you code expenses after you have paid them. Review the report suite and get the reports you want into your favourites list.